Grow Your Business Online with MVLA Digital in 3 Simple Steps. 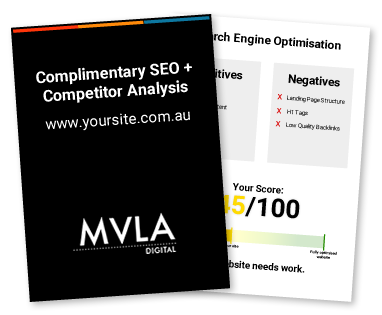 MVLA Digital is a Brisbane Based Online Marketing Agency. We help your business succeed online with Web Design, SEO, Google Adwords, Facebook Ads, & More! Powerful traffic generation tools like Google AdWords, SEO & Email Marketing drive targeted, motivated traffic to your site. We ensure your site visitors are informed, excited, and motivated to act - which means more sales and leads at less cost. We use a battery of cutting-edge web analytic software to constantly update, measure and maximise your Return on Investment. How does your digital marketing compare to your competitors? Are you leaving money on the table? Rate your website with our complimentary SEO + Competitor Analysis. This offer is obligation free and also includes next steps and recommendations for your website. Don’t have a website or want to send an enquiry? Click here. For more information about our programs or to have a chat with someone about your digital marketing presence, please fill out the form below and we’ll get in contact with you.